Coleus is the traditional name for a genus of popular landscape plants that have now been reassigned to the genera Plectranthus and Solenostemon. Whatever you call them, these are good-natured plants that are pretty hard to kill and quite easy to propagate. Coleus is a tropical perennial plant that is normally grown as an annual by gardeners who live north of USDA hardiness zones 10 and 11. One of the few plants grown almost entirely for its foliage, coleus are actually easier to grow in containers than in the ground, since they thrive in the loose texture of a good potting soil. There are about 60 species of coleus, all native to Malaysia and other parts of Asia. When various cultivars of these species are added in, there are hundreds of different types available, and each year sees new introductions. These beautiful plants come in green, purple, orange, red and yellow varieties, with many different leaf patterns. Container gardening with coleus is not difficult, but it requires a bit of preparation. It is slightly different from traditional outdoor gardening, mostly due to different maintenance requirements. Here are some tips for success container gardening with coleus. Coleus can be grown in containers both indoors and outdoors, where pots of coleus work well to ornament a deck, patio, or window box. Make sure your pot is large enough to comfortably accommodate your coleus. Coleus likes fairly moist soil, so if you use terra-cotta pots or pots made with another porous material, line them ​with plastic to keep the soil moist. You can also use old buckets or bright plastic pots that contrast with the coleus' colors. Coleus is a fast-growing plant, so make sure to choose a pot that is roomy enough. Coleus is also fairly easy to "pot up" when it outgrows its container. If the colors of your coleus plant look washed out and dull, it may be getting too much sun. Traditionally, coleus is regarded as a shade lover, and while recent cultivars have made this plant more tolerant of sunlight, it still does not like direct, sustained sunlight. Check your coleus variety to make sure, but most need shade or partial shade in order to really thrive. If your plant starts to lose leaves, however, this is usually an indication that it is in a spot that is either too dark or too cold. Lack of light is usually not a problem when growing coleus in pots outdoors, but during cold winter months, coleus grown indoors may have trouble getting enough light. Place pots of coleus where they will get sunlight through windows, or provide them some supplemental fluorescent light when growing them indoors in winter. This plant likes moist, but not wet, soil. It is not very drought tolerant, so it is important to find that balance and keep your coleus well-hydrated but not soggy. When potting, use a high-quality potting mix, and make sure that your pot has good drainage. The best combination is a well-draining soil that is watered regularly. Soil that is too dense may cause the roots to rot. In hot months, coleus grown in pots outdoors will need watering once or twice a day. If they are grown indoors, watering every two or three days is usually sufficient unless the indoor air is especially dry. 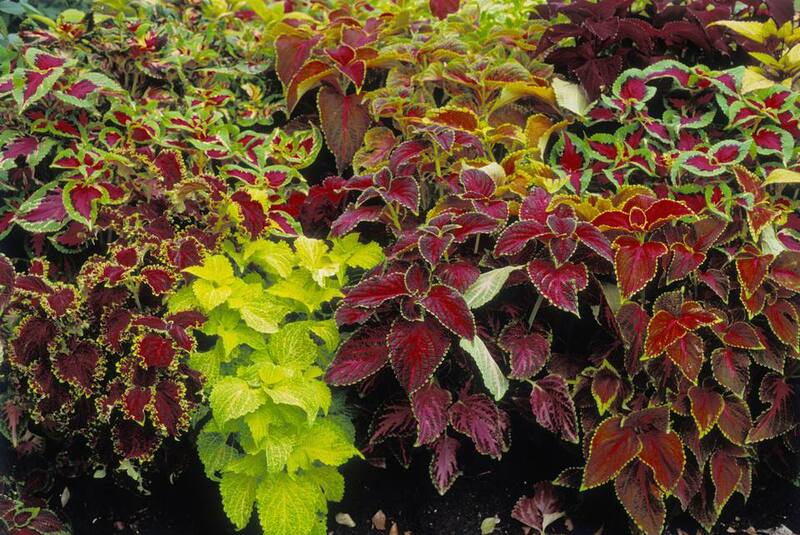 Like most plants with colorful foliage, coleus needs regular feeding. To keep your coleus thriving, mix a slow-release fertilizer into the potting soil when you are starting your plant's container. Then, feed it a diluted liquid fertilizer every week or two as the season progresses. Because container plants need frequent watering, nutrients are quickly washed away. Any potted plant will require more feeding than the same plant in a garden bed. The more often you water, the more feeding your plant requires. In the hottest months of summer, outdoor potted coleus plants that are watered once or twice a day may require weekly feeding. Plants that get too tall can simply be "beheaded" at the top. This will prompt bushy outward growth and denser foliage. Excessive legginess is usually caused by a plant that gets too little sunlight, so if this is a continuing problem, move the container to a spot that receives a little more sunlight. A coleus plant grown indoors, especially in winter months, is more susceptible to this, so you may need to offer your plants some supplemental light. There are two ways to keep your outdoor coleus alive through the winter. Coleus that are already growing in pots outdoors can simply be brought indoors and placed in a relatively warm and bright spot in your home. This method can take up a lot of space, though, so many gardeners choose to take cuttings from their favorite coleus plants and root them indoors. At the end of the growing season, well before the first frost, cut sprigs of your favorite coleus, each containing several good leaves. Place each cutting into a clear glass vase or jar filled with water. Make sure to pluck off any leaves that are below the water level. Place the vases in a bright, warm area, and allow the cuttings to root themselves. Roots generally appear within a few days, and over a period of a month or two will develop into a thick mass of roots. Make sure to keep the vases filled with water as it evaporates and is consumed by the plant roots. If the water grows cloudy or brownish, replace it with fresh, room-temperature water. The cuttings can be left to continue developing roots right up until planting time in the spring, or, you can plant them in potting soil in mid- to late winter to give them a headstart on spring. As soon as the roots have formed a tangled mass, they can safely be planted in potting soil. During the winter months, small potted coleus will need plenty of light, either from a south-facing window or from auxiliary lighting. Note: Some varieties of coleus root more readily than others. The more exotic varieties with large, unusual leaves can be a bit temperamental about rooting, so with these, it is a good idea to take plenty of cuttings in case some of the cuttings fail to root Smaller, more traditional types of coleus root themselves very easily.